Quick overview A student-friendly guide to the life, work, context and reception of the author of Wide Sargasso Sea. Since her death in 1979, Jean Rhys's reputation as an important modernist author has grown. Her finely crafted prose fiction lends itself to multiple interpretations from radically different critical perspectives; formalism, feminism, and postcolonial studies among them. This Introduction offers a reliable and stimulating account of her life, work, contexts and critical reception. Her masterpiece, Wide Sargasso Sea, is analyzed together with her other novels, including Quartet and After Leaving Mr Mackenzie, and her short stories. Through close readings of the works, Elaine Savory reveals their common themes and connects these to different critical approaches. 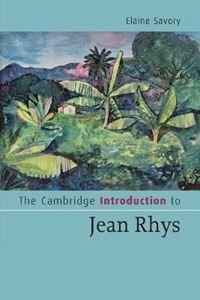 The book maps Rhys's fictional use of the actual geography of Paris, London and the Caribbean, showing how key understanding her relationships with the metropolitan and colonial spheres is to reading her texts. In this invaluable introduction for students, Savory explains the significance of Rhys as a writer both in her lifetime and today.